Our product range includes a wide range of zinc shot and zinc cut wire shot. 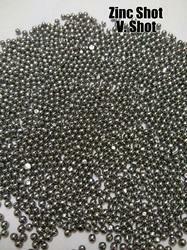 We are custom manufacturer of Zinc Shot. Features of zinc shot include galvanic protection corrosion resistance. Zinc shots are suitable for deburring deflashing of zinc or aluminum die cast parts in both wet dry operations removal of impregnated sand from sand castings custom manufacturer of zinc shots. It is used for removing oxidation skin, burr, eliminating surface defect, removing stress, etching, unknit, strengthen, prevention rust before painting of metal die-casting, precision casting, hardware tool, machinery manufacturing, automobile spare parts, apparatus,pump valve industry. V.Shot Zinc Shot is a soft metallic abrasive used primarily in the die-casting and gravity casting industries for the de-burring and de-flashing of aluminum and zinc alloy castings. Zinc Shot is approx 2.5 times denser than aluminum shot. Further, these shots can be easily used in wet as well as dry operations and also assist in effective removal of impregnated sand from sand castings. Other than this, it is also used for removal of burr, surface defect, oxidation skin, unknit and is used in general cleaning of light metal castings as well as other non ferrous products. Help in reducing wear and tear on blast equipment as compared to other metallic abrasives.